Fan favourites David Tennant and Billie Piper will reprise their roles as the tenth Doctor and Rose Tyler in the upcoming 50th anniversary Doctor Who special. Amidst the excitement surrounding the mid-season premier of Doctor Who's 7th season earlier this week, some interesting information has surfaced about the British sci-fi's upcoming 50th anniversary special. David Tennant and Billie Piper, the tenth Doctor and Rose Tyler respectively, will reprise their roles alongside Matt Smith and newly-minted companion Jenna Louise Coleman. John Hurt (Tinker Tailor Soldier Spy, Alien, Harry Potter) will also co-star. 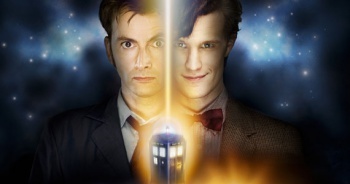 Steven Moffat, the lead writer for the show, stated that the special will be shot in 3D, with frequent Who director Nick Hurran behind the helm. The special will feature the Zygons, a race of shape-shifting extraterrestrials. The Zygons were previously featured in the fourth Doctor episode, "Terror of the Zygons" - which presented the aliens as malevolent refugees bent on conquering Earth after a stellar explosion destroyed their home planet. Doctor Who fans might remember that the last time we saw the tenth Doctor, he created a half-human half-time lord clone of himself and sealed him away in a parallel dimension with companion Rose Tyler. It's highly likely that the 50th anniversary storyline will take place in the parallel universe, as it's the only logical explanation that would see both Smith and Tennant appearing alongside each other (as well as the appearance of Rose). Freema Agyeman (Martha Jones) and John Barrowman (Captain Jack Harkness), previous companions of the tenth Doctor, have stated via twitter that they won't be returning for the special. The Royal Mail recently rolled out a collection of Doctor Who Stamps to mark the 50th anniversery of the show. Oh joy, Rose "Sue" Tyler is back. Probably the worst/most annoying companion that's ever been in Doctor Who. I'm losing interest in the special ... No Nine, no Jack, no Martha, no other doctors. What's the point of this episode again? Right, to celebrate fifty years of Doctor Who. GOOD JOB. Can't wait to see how this spins out. "Terror of the Zygons" - which presented the aliens as malevolent refugees bent on conquering Earth after a stellar explosion destroyed their home planet. River Song is pretty bad, yeah. But she's equally annoying as Rose as best, and she hasn't really gotten as much coverage as her so she doesn't grate me as much. For crying out loud the Doctor cried over Rose for a whole damned season, came back and got her own damn half-doctor! Barrowmaaaaan! Why didn't they let you in! Also, no Baker, McCoy or Davison as older parallel-world Doctors? Or at least another chance for McGann to reprise his short appearance as Eight? Gotta say, I did expect more of this special. They were afraid he'd sing again? Christopher Eccleston said he wouldn't do it. Most annoying companion? Close, but she's no Aldric. I find myself liking Tennant less and less now we have an alien Doctor like the good old days. I still wanted to see Big Tom have a shouty cameo at least. He wasn't my first Doctor, Wurzel Gummage was, but he has always been my favorite. I love that 10 and Rose are coming back (Most likely it will be Clone-10 and Rose from the alternate dimension), but the Torchwood fan in me weeps for no Captain Jack. Since it doesn't look like we'll be getting a 5th season of Torchwood, I would've really liked to see what he was getting up to, maybe some closure for the Torchwood team? Sadly, most people will see David "I don't want to go!" Tennant and forget the fact that that the cast is lackluster. And squeeeeeee, because she's now the most popular companion ever because...Reasons. Anyway, I knew the odds against Eccleston were slim, but I was holding out hope. Barrowman (BARROPWMAN! *shakes fist*) is the one that surprises me me, since I thought I had read he was interested. ...On the other hand, the main reason I wanted Barrowman (BARROWMAN! *shakes fist*) was to have Captain Jack in the same room as River Song, and there's no reference of Alex Kingston, so I guess that Fanta...Errr...Dream is gone. Are you kidding? He was awesome as the Nazi in Springtime for Hitler. I hope it's not those farting aliens. No Why oh Heavens above why is Rose back. Even for an episode it's too much. Why no Donna? Well, TBH, the audience wasn't supposed to think Adric was wonderful the way there are with Rose, nor was he a love interest for the Doctor. Wow Moffats comment about the show moving forward and not looking back... Its the 50th anniversary? Its just some cop-out excuse for him not to include as many Doctors as he can. At least Big Finish is treating the 50th with some respect. The sooner Moffat is out of the head position, the sooner the show can 'move forward' and return to being good. Not the garbled, convoluted mess that Moffat has turned it into. Using logic when talking about Doctor Who? That's crazy! In "The Five Doctors" (1983) Richard Hurndell (Playing the first doctor as William Hartnell had passed away), Patrick Troughton and Jon Pertwee and Peter Davison all met. Clips of Tom Baker were in the Five Doctors but he did not meet any of the others. In "The Two Doctors" (1986) Patrick Troughton and Colin Baker met each other. In "Time Crash" (2007) Peter Davison met David Tennant. All of the above didn't have half-human half-Time Lord clones to meet. The TARDIS is a finiky thing when it comes to time lines. Also the Doctor's enemies and the Time Lords themselves have all been responsible for bringing various incarnations of the Doctor together in one place. To be fair Billie Piper has also stated that she isn't returning for this special and now is. On the OP This is a show about a reincarnating time traveler getting different incarnations of the Dr meeting requires no parallel universe shenanigans, unlike say Bond the premise pretty much lends itself to this sort of thing. That they restrain themselves to the occasional anniversary special shows a level of restraint that many IPs wouldn't manage with similar excuses. Rose requires a little bit more mucking about, but since at least Tennant's incarnation the show has shown its not afraid to occasionally break or bend to get round the supposedly absolute rules of the IP's universe to get a good plot. There needs to be a point where the writers need to stop, take a look at themselves and write something that isn't fan service. I'm getting really sick of Doctor Who where the same old things happen because the Doctor is a fantastic infallible person who can never lose. I want an episode/series where the bad guy wins or where the Daleks/Cybermen/Any recurring bad guy isn't a joke. Oddly the more I hear about the specal, the more I miss Patrick Troughton. I suppose that's why I quite like Matt smith's take on the dr, it far more like Patrick's version then any of the others... Even down to stupid hats. Now that would be a meeting of dr's I'd pay ood money to see. Bring back Tom Baker and I might be interested. And as I remember it he actually refused to take part in "5 Doctors" so they had the machine transporting them break down and freeze him in place. I think the main problem they have a multi Doctor episode is the fact that most of the surviving Doctors are considerably older, fatter and balder than when they regenerated. The worse one being Colin Baker, only Tom Baker and Paul Mcgann look unchanged enough to get away with it. I don't know about THAT. We last saw Rose in the abomination "The End of Time," where the Tenth goes to see her before this all happens, so he can say his extra emo goodbyes. Seems like it'd be easy enough to do the "The Doctor can meet himself on this rare instance because ponies" like the other crossovers did. And as such, it seems like pulling them out of any moment in time would be equally as obvious. Bringing back Tennant? And only Tennant? Well that perfectly sums up Phd Who. I guess this is just so they can sell more DVD's for the kids. Who have no idea what came before Dave and Billie Pipers chest. Awesome, another chance for people to fawn over the weakest of the 3 new Dr. Who's. Real shame that it won't be Christopher Eccleston, personally I think it'd make more sense to have The Doctor that started this new generation of the show rather than the one that people love for...reasons.